1 - Let's fly on New Year's Day! Let start a new tradition and start the new year off right. 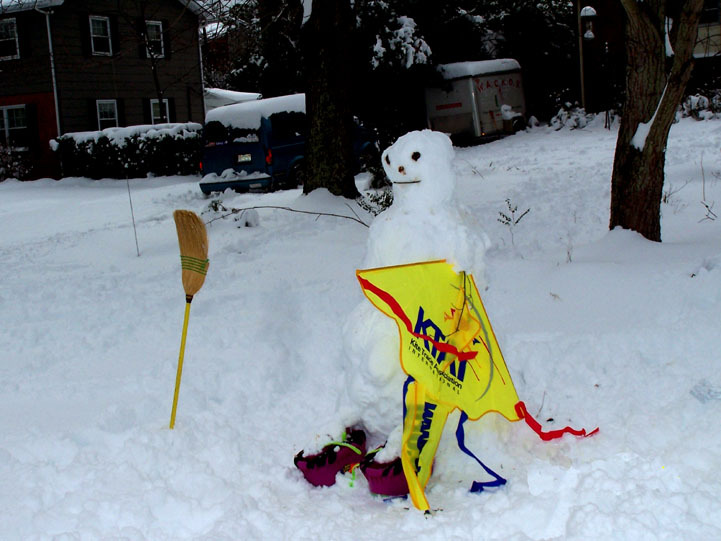 Some folks have a "It's too Damn Cold To Fly" party, what will we call ours? Again, let's try Mint Hill Park. 18 - Oops. Because of non-existant winds, we postponed today's flying to next Sunday, December 26th. If you're in town and want to show off your new stuff or just want to get together, let's meet at MINT HILL PARk because Frank Liske is usually closed for the holidays. Check the main page for a map to Mint Hill Park. See you there. 26 - After Christmas fun fly! Bring your new stuff or just yourself to Mint Hill Park and let's have some fun! 6 - This is our normal scheduled fly at Frank Liske Park. Some of us are going to Camden, SC for an airshow to see the Thunderbirds perform. The Thunderbirds and other flying machines were pretty cool and the weather was great. But it was also great at FLP for the two flyers that showed up. We got to entertain millions of soccer kids and parents and a whole flock of tandem bicyclists. Some of them even realized we were flying "steer able kites" and no one said anything about how much better they would fly with tails. Let's make next weekend a make up fly for anyone that missed today. 13 - Since so many went to the Air Show in Camden last weekend, this would be a good date to have a makeup fly for them and anyone else who missed the gorgeous weather for one reason or another. As of now, plan for an impromptu fun fly this Saturday. Weather permitting, naturally. 20 - Third scheduled fun fly.We'll be flying at the Laurels, a nursing home in Pineville, instead of Frank Liske Park this day. The flying will start about 1 p.m. but some of us will be there to set up banners, etc. before that. Could be a group dinner someplace close after the flying. Contact Grumpy for maps and stuff. 27 - Turkey Weekend. If you'll be around, send out a note and see who else is staying around. Frank Liske may be closed but Mint Hill Park should be open so we can fly there. 11 - 16, AKA Convention, Seaside, Or. See http://www.aka.kite.org/ and look for the link to the convention information. 16 - Weather says, "Highs around 70. Southwest winds around 10 mph...increasing to 15 to 25 mph with gusts to around 35 mph in the afternoon." Leave your ultralights at home and bring the vented kites. This could be a real blast! 23 & 24 - Saturday & Sunday, Carolina Kite Fest XVII, Atlantic Beach, NC - see http://www.kitesunlimitednc.com/kitefest.html. There will be WACKOS there! But don't let that scare you off! For more details call Kites Unlimited 252-247-7011. This festival was great! The weather was perfect, the winds were near perfect and the sky was filled with color! Many people came by to visit and fly with us and we handed out just under 100 "I flew with the WACKOS" buttons. There are more pics in the kitefliers.com gallery. Click the link at left to go there. GREAT! FANTASTIC! FUN! WIND! SUNSHINE! OUTSTANDING! Many thanks to the Beech Mountain Chamber of Commerce for a terrific event, great support and delicious meals. The event is just over and we're already looking forward to the 3rd Annual Mile High Kite Fly! If you missed this one, you REALLY MISSED something!!! 11 - Finished kite sails are due so we can start sewing them on the WACKOS club arch. Mail them to Marty or we'll arrange to meet and collect all the sails. 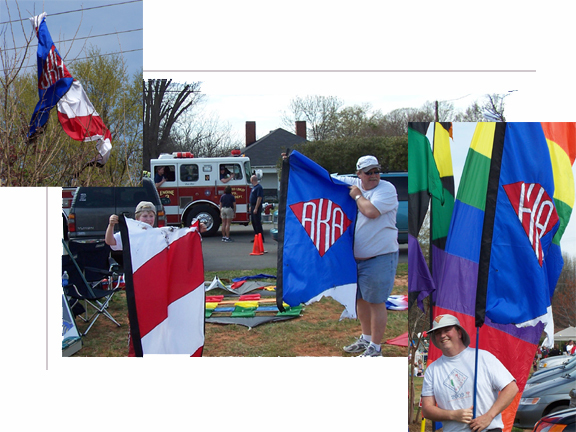 I hope to have the arch ready to fly for Carolina Kite Fest. See next month's calendar for info. 18 - Third Saturday scheduled fly at Frank Liske Park. 7th - Good day! Winds were changeable but pleasant, the Sun was bright and the temps were milder than normal. A good group came for flying and socializing. It's amazing how the socializing slacks off when the winds come up but that's when the flying starts. There were fighters, an Airform ,Revs, quad foils, some long unflown Ultras and a rare SUL Deca 6, and a rok that flew like one. At one point, there were two bols inflated and spinning. Y'all missed a really nice day for early August. I hope it's a harbinger of Fall to have temps and winds like these! 21st - WOW! What a day! There was some great flying today. Fortunately, the weather guys were wrong, again, and the rain stayed away until the evening. There was a Blue Meanie under a new pilot kite, a couple French kites doing some outrageous tricks, a new genki that didn't go after anybody, a big. new delta, a Red Rainbow Skydancer and a bunch of fighters. We broke up early because all the shade tents got left at home - we actually believed the weather liars about the clouds - and there were a bunch of very red WACKOS. But a little cajun food eased the pain. See you all in a couple weeks at the 2nd ANNUAL MILE HIGH KITE FLY in Beech Mountain, NC. 3rd - Celebrate the 4th at Frank Liske Park if you're staying in Charlotte. Wonder where the winds were - they sure weren't at the park. But lunch was good and leisurely with some fine company. 10th - Maybe? anyone around? 17th - There was an MEFM M2 spotted in the air today. 24th - Field trip to Blue Moon Kites. Grumpy's got details. 31st - This is a blue moon day - make sure you get out and fly a Blue Moon Kite ... someplace. Just do it! 5th - First Saturday - If anyone's around, I guess we'll meet at the usual place. 19th - Third Saturday - Waaaayyyyyy too hot to fly but lunch at Louis' was cool. 26th - Light and variable winds but flyable. 1st - May Day! May Day! Darn right! We got rained out. But we're rescheduling for May 15th - hopefully the weather will be more to our liking. sorry. 15th -Rain date for May Day! May Day! Better late than never - check out the poster here. 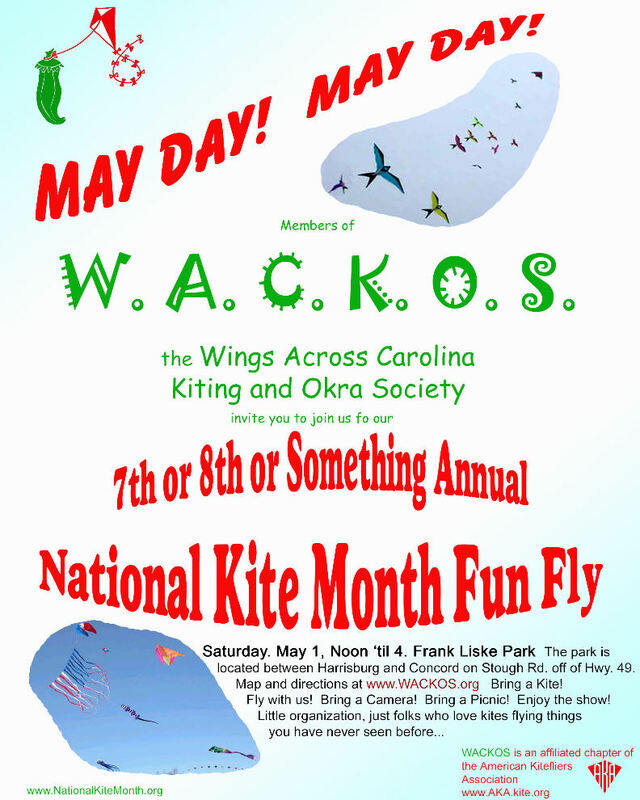 The date isn't right but the flying is still scheduled for Saturday at Frank Liske Park. We'll start getting there about 10:00 or 10:30. We had a good time anyway, despite what the park said. Good crowd, flaky winds, but we flew stuff. We even had some new visitors, Too. Forrest & Forrest III came to visit from the NC mountains and Jim's folks, Alice & Vern, came from St. Cloud, Minnesota to get a tan and surprise Jim for his birthday. They did both! 22nd - We've got a small fly and demo in Pineville. Contact Grumpy for details. 29 - 31 Memorial Day. There was some flying down at the beach. Check out some pictures at Jim P's Photo pages. Awesome gator! This is also the date for the Mighty Kite Flight in East Flat Rock. Directions: take I-26 West to exit 22 go west off exit to Spartanburg Hwy (approx 1 mile) go south on Spartanburg Hwy (also known as 176) to Blue Ridge Road (approximately 1 mile) turn right or west on Blue Ridge Road go 3/4 mile field is on your left! A nice ride from Charlotte to get to I-26 is to take I-85 to the exit for US 74 around Kings Mtn, through Shelby and on to I-26. Holden Beach is having "A Day at the Docks" to kick off the beach season. There's a little info here http://www.holdenbeachmerchants.com/. Check out some pictures on Jim Ps photo pages. 6th - This was a pretty busy weekend. Friday afternoon, Grumpy, Linda, Joe and Marty worked off a big Luis's lunch at FLP with some high wind flying. Linda, to her surprise, found out how much those small Gomberg baskets pulled. A rainy Saturday morning turned into a pretty nice afternoon for Grumpy, Jerry, Linda & Joe and Sandra who added lots of color to the sky. Marty found an open soccer field in Matthews and practised some quad lines. Sunday also turned out pretty nice and Stu, Doug and Marty introduced South Charlotte to some high wind quad flying (also called "tenderizing" the ground), how to untangle RC big wheels from quad linesets and avoiding soccer players that don't respect the folks that were already on the field. It was a good weekend. Welcome to everyone that came out to fly and watch where ever we were. Glad you came back. Hope y'all come back to fly again. 20th - scheduled fun fly at FLP and very close to the beginning of Spring! We had a real good day - plenty of sunshine and good winds for everything we tried to fly. But, it was variable so we spent some time putting things back up, too. Dory brought her new camera and took a bunch of pictures. I've put some on a page for your enjoyment. Click here to see the pictures. 27th - We've got two things going on this weekend. Lake Park Kite Day in Indian Trail and the Cornelius Parks & Rec 2nd Annual Kite Event. For Lake Park, see http://www.lakeparknc.com/. There isn't a lot of info, but there is a pointer to some pictures from last year. Marty is planning to go and will need some help with banners and some show kites. Directions are: go East on Independence Blvd (Hwy 74) past I-485. About 3 miles East of I-485, there is a stop light at Unionville - Indian Trail Rd., turn left. The entrance to the Village of Lake Park will be on your left. Follow the signs for the Kite Festival or Founders Park. We've been getting there about 9 or 9:30. The Cornelius Parks & Rec 2nd Annual Kite Event is a first for us and Grumpy has said that he will be there to support them. The event is from 2:00 to 4:00 p.m. in Smithville Park, 19710 S. Ferry Street. Directions are: I-77 North to exit 28. Turn right on Catawba Ave. Turn right on Ferry Street. There's a sign for the park on the corner of Catawba and Ferry St. This is a combo art/craft event centered around kites, sidewalk chalk, disc frisbee with the opportunity to purchase and fly a kite. They're hoping for a demonstration and I'm pretty sure Grumpy can handle that! Grumpy was joined by Jim & Laura, Jim Martin and Dottie Martin. They tell me there was a little blast of wind in the afternoon that caused them some trouble. I think this picture says something about it. 1st - SUPER BOWL! Watch the Panthers play the big show against the Patriots. 21st - Good flying day. Strong but variable winds, but only a few flyers. ? Where were y'all? Welcome to Dave and Jeff from Winston! 3rd - "Toto, I don't think we're in North Carolina anymore." What a day! Good breeze to about 5 mph. Bright sun. Temps close to 70! Kite flyers wearing shorts! WOW! We had a great showing and a great show. Lots of people dropped by to chat and watch. There were a bunch of Revs in the north field and in the south field: some singles - a really nice white, yellow and blue power sled - some dual liners with Stu doing his amazing tricks again. And a face from the past - Fritz and Danielle came by for a visit and Fritz got fired up again after reacquainting himself with a Lil Zede. Real good to see him again. 17th - Cool but very pleasant and variable winds. Flying foils and NPW9s will get the blood flowing and work up a sweat. Great lunch afterward at Louie's. 31st - This is an off week, but if you're of a mind to fly, we're meeting for lunch at Louie's in Harrisburg about 11:30. Then heading to the park for some afternoon flying, weather permitting, naturally. Join us if you can. Check out "Art on a String" in Gallery L in the Main Branch of the Public Library of Charlotte - Mecklenburg. See their site at http://www.plcmc.org/galleryL/artString.htmfor details. Exhibit ends February 1st. And for those of you that just can't get enough - 4 years of WACKOS! Click the links below to visit the pages.